PETALING JAYA: Malton Bhd plans to launch eight property development projects worth some RM2.2 billion over the next three years, as well as beef up its construction division. Executive director Hong Lay Chuan said Malton's construction unit has about RM200 million-odd worth of jobs in hand and that the division currently contributes some 30 per cent to group revenue. Hong told reporters after the company's shareholder meeting here yesterday that Malton is bidding for design and build projects from the private sector. He did not rule out tendering for government projects, especially those that come under the Economic Transformation Programme. "We are bullish on both sectors and hope to do better this year. We do anticipate high cost in land and raw materials but if market sentiments hold up, we should do okay," he said. For the nine months to March 31 2011, Malton's net profit increased threefold to RM45.7 million on a revenue of RM294.5 million. On property development business, Hong said Malton foresees the market to be strong this year as demand for new houses is increasing. Malton's eight new projects comprise medium to high-end residential and mixed property developments, the majority of which are located in the Klang Valley and some in Penang. Hong said Malton is poised to benefit from the new launches, based on the success of its existing projects in the marketplace since mid-2010. Malton has five on-going residential and mixed development projects worth some RM1 billion in the Klang Valley. 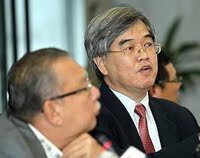 Hong said the projects in Bukit Rimau and Mutiara Indah in Puchong, which consist of 101 units of shop units and terraced houses respectively, were sold out even before the launch. "We are looking for landbank to expand our property development division hence the need to raise funds," he said. Yesterday, shareholders approved Malton's plan for a rights issue to raise between RM139.3 million and RM156.6 million. Malton will use part of the money to buy land and undertake property development projects. Some RM60 million will be used to pare debt. 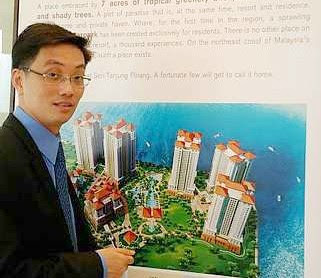 Eric Chan with an artist’s impression of Quayside condominiums in Seri Tanjung Pinang phase one. “Penang's heritage and cultural appeal (as a Unesco World Heritage site) has won it many accolades, including the 2011 vote by Yahoo as one of the Top 10 Islands in the World to visit,” Chan says. SINGAPORE: Malaysia's largest property developer, Sime Darby Property Bhd, is eyeing for new projects, especially redevelopment projects in Singapore, said managing director Datuk Tunku Putra Badlishah Ibni Tunku Annuar. “We are constantly looking for new projects, but obviously as you see the land here is very scarce and expensive, so we are doing more on redevelopment projects. We have old warehouses, we convert them into office buildings that kind of projects but we own quite a few buildings in Singapore, so we collect rental,” he told Bernama. For the tenants, Tunku Putra Badlishah cited one of the buildings the company had in Dunearn Road, Bukit Timah. “We rent out a lot of buildings to our own companies. The motor division, for example, is big in Singapore,” he said. Asked whether Sime Darby Property is looking for more land for its future projects, Tunku Putra Badlishah said most of the land here was standard in that they are mostly government tendered. “We have tried in the past and we will continue to bid for them,” he said. He said Singapore was a good market for Sime Darby Property. “We've been successful in Singapore. We have a team here already, so it makes sense for us to continue looking at Singapore,” said Tunku Putra Badlishah, who is here for the Building and Construction Authority Awards (BCA Awards 2011), which recognises excellence in the built environment. Sime Darby Property's Idea House has been awarded the “Platinum Green Mark” recognition, the first time that the state-run BCA is awarding a platinum recognition in the residential category. Tunku Putra Badlishah received the award on behalf of the company from the National Development Minister Mah Bow Tan, who also launched the inaugural Construction Productivity Award last night. Tunku Putra Badlishah said from the Idea House, Sime Darby Property was able to produce photovoltic cells enough to produce to power the house. “We've been implementing a lot of this switches almost six months ago. So all of our future projects will have some elements of sustainability,” he added. Meanwhile, the BCA Award is an annual event to honour and pay tribute to displays of excellence in the built environment in the areas of safety, quality and sustainability and user-friendly. This year, it marks a few firsts in the building and construction industry. KUALA LUMPUR: Malaysian developers have won four top places out of the 14 categories contested in the Fiabci International Prix d’ Excellence Award 2011 with another three being runners-up, making this year’s outing the most lucrative. The winners, from nine countries namely the United States, China, India, Malaysia, Brazil, Russia, Hungary, Singapore and Cyprus, were announced in a gala event held in Cyprus on Thursday night. The Malaysian developers who picked up the four awards were SP Setia Bhd, Gloharta Malaysia Sdn Bhd, Sunway Pyramid Sdn Bhd and The Western Langkawi Resort & Spa. SP Setia won the award for Precint 3 Setia Eco Park in the low-rise development category, Gloharta’s Bunga Raya Island Resort and Spa in Kota Kinabalu was the winner in the resort development category and Sunway Pyramid’s mall expansion was top in the retail development category. The other winner was The Westin Langkawi Resort & Spa. The runners-up were MMC-Gamuda Joint Venture Sdn Bhd’s Kuala Lumpur Smart Tunnel, Coronation Springs Sdn Bhd’s Springtide Residences in Tanjung Bungah, Penang, and Cahaya Jauhar Sdn Bhd’s Kota Iskandar (Phase 1) in Nusajaya, Johor. About 60 projects were submitted for the international award. International Real Estate Federation (Fiabci) Malaysia president Yeow Thit Sang said this was an indication that our standards had gone up. “For those who won, their victory is a marketing tool for them. It is a recognition of the holistic nature of their respective development and how it benefits the community it is intended for. They have won because they have met the criteria,” he said. The successful outing, he added, was significant as it showed that the Malaysian property sector was evolving with new products and new concepts entering the market. Setia Eco Park spans 790 acres of freehold land in Shah Alam of which 25% of the land has been set aside for lakes, gardens and walkways. It has extensive facilities like tennis courts, swimming pools, badminton and squash courts. The award marked the SP Setia group as the only Malaysian developer to be recognised three times as a winner at the global level by Fiabci. It was the second Prix d’Excellence Award for Setia Eco Park following its 2007 win in the Master Plan category. “We are extremely proud of this achievement and recognition given by an international world body like Fiabci. As the country’s No. 1 property developer, we hold our heads high as we carry the Malaysian flag abroad,” said SP Setia group president and chief executive officer Tan Sri Liew Kee Sin. PETALING JAYA: MK Land Holdings Bhd's net profit jumped more than two-fold to RM7.2mil for the third quarter ended March 31 against RM2mil a year ago due to stronger performance of the property segment. Its revenue for the period rose to RM165.1mil from RM94.7mil a year ago. Going forward, MK Land's executive chairman Tan Sri Mustapha Kamal expects “double-digit growth” buoyed by its on-going property projects and new launches. In a briefing yesterday, Mustapha said the “momentum” for the group to achieve double-digit growth was already in place. MK Land’s incoming CEO Lau Shu Chuan with Tan Sri Mustapha Kamal. For the nine months ended March 31, MK Land posted a higher net profit to RM15.8mil on revenue of RM292.9mil. The higher net profit was due to higher revenue and lower finance cost. Its property development segment generated RM249.5mil, representing 76.2% of the total revenue for the nine months ended March 31. The revenue was mainly from its property projects in the Klang Valley, particularly its Damansara Perdana development. MK Land had also appointed Lau Shu Chuan as its chief executive officer effective June 1, taking over from Mustapha. Lau is currently the chief operating officer. Mustapha will be redesignated as non-executive chairman. Mustapha made a comeback as executive chairman on June 25, 2008 when the company was facing difficulties. The company posted a net loss of RM60mil for the financial year ended June 30, 2008 (FY08). He managed to steer the company out of turbulence and felt that it was time to pursue his charity works through his foundations - Yayasan Emkay Foundation, Orang Utan Island Foundation and Pulau Banding Foundation. “I do not want you to speculate. There's no other reason,” he said when explaining his leave from the company. Mustapha will remain as the major shareholder of MK Land. Lau agrees with Mustapha on the company's prospects. He said its products were well accepted in the market and that the group had a landbank of 5,000 acres with various developments. On its gearing level, Lau said MK Land had managed to bring down its borrowing significantly. Its total borrowing stood at RM275mil against its shareholders fund of RM1.1bil. “We will bring it (borrowings) lower. Our interest is eating into our profit. We have a systematic plan to bring down the gearing level,” he said. Lau, however, said the company's borrowings might increase as it bought new landbank and to finance its joint venture project to develop affordable housing in northern Bangalore, India. Meanwhile, he said MK Land's shares were “undervalued”. He said the price, at over 30 sen, was still below the company's net tangible assets (NTA). As at March 31, MK Land's NTA stood at 87 sen per share.